HomeBoard GamesRun as stealthily as you can. Can you escape from Colditz? do you have what it takes to get past the guards? 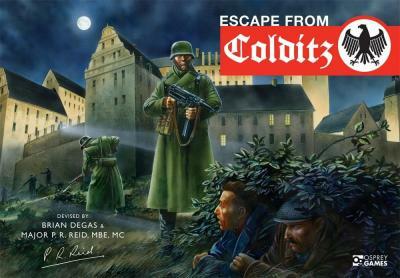 Osprey Games have released the 75th Anniversary Edition of Escape From Colditz! Designed by Pat Reid, a British officer who escaped from the Colditz prisoner-of-war camp during World War II, and Brian Degas, writer of the iconic TV series based on Pat’s escape, it is often named as one of the greatest board games in British history. This edition, published to coincide with the 75th anniversary of Pat Reid’s escape, features completely new art-work painted by fan-favorite historical artist, Peter Dennis. Along with a complete set of wooden pieces, the box will include replicas of prisoner-of-war artifacts from Mr. Degas’ extensive collection! I have yet to get a game in with this yet but its due an article so instead i thought i would talk instead about the actual box and contents, firstly the design and packaging on this game is awesome everything manages to look both new and shiny as well as authentically battered and tatty at the same time. The board is massive and really does look like it will make an awesome evening of gaming. The rules on first pass seem a little bit odd and didn’t make sense but after re reading them it actually looks like quite an easy game to get to grips with, I can’t imagine for a second that it is an actual easy game to play, but that’s down to the complex nature of having to get things to escape with getting to a suitable location and getting out whilst trying to avoid the guards. The playing pieces are what I would call the classical wooden playing pieces and there are enough of them to play the different combinations of players. All in if you remember this game from when you were younger or have never played it before I would definitely suggest its a good one to get hold off. I will write a bit more on it after I have managed to coral some people into a game. For some reason this article has taken an age to write mainly because I feel like its trivialising something that actually happened, I know it sounds weird especially as I have written about Bolt Action on more than one occasion with absolutely no problems at all. Truth be told I think its the history pamphlet that’s included that gives real life accounts of what happened, it just seems to make this more than a game really as it drives home what you are doing was probably attempted to some degree off success or not by Allied Forces held in Colditz Castle.